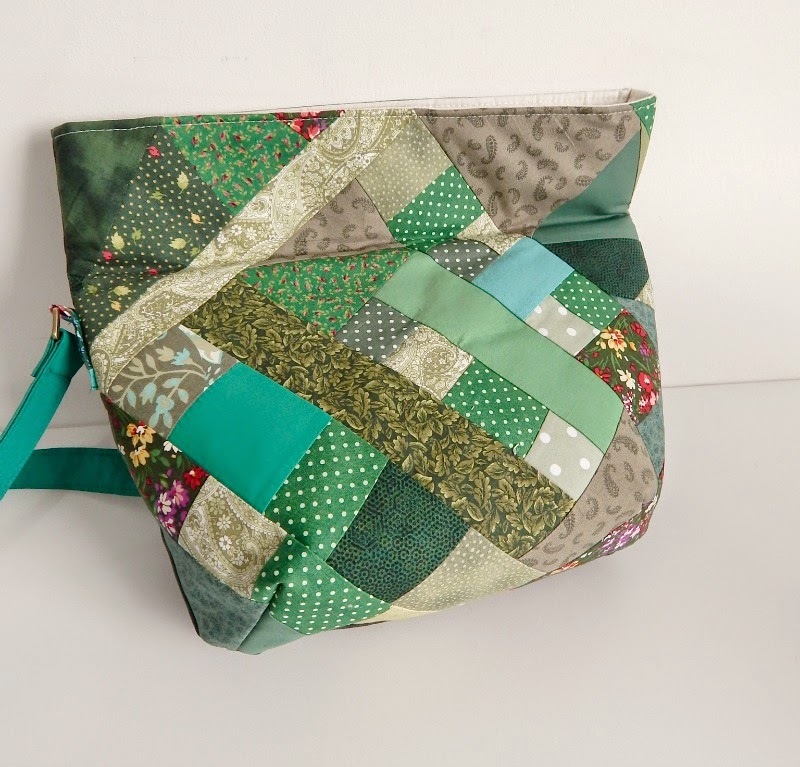 Sew Along - The Lombard Street Bag! Starts March 1st 2015! How many of you are like ME and have a TON of fabric scraps that you can't bear to part with BUT are just sitting idle in a monstrous pile? 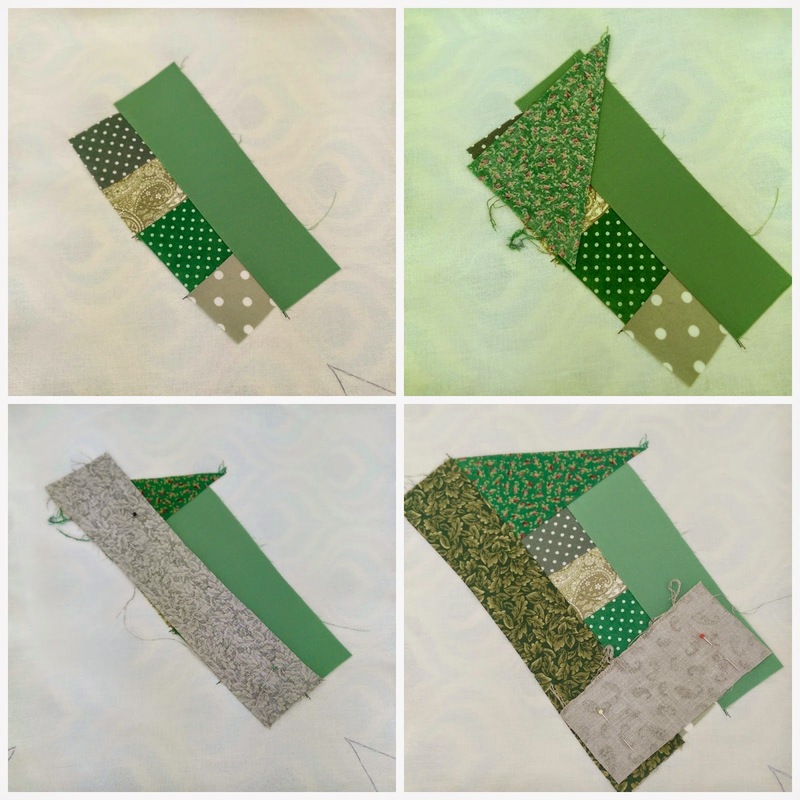 Well Samantha has a great tutorial showing us just how to turn those piling up scraps into something FANTASTIC....AND the good part is, she is sharing the tutorial here with us. I'm Samantha, aka Mrs H, from Sewing patterns by Mrs H. I also blog over at 'At home with Mrs H' where you can see a slice of our crazy family life! 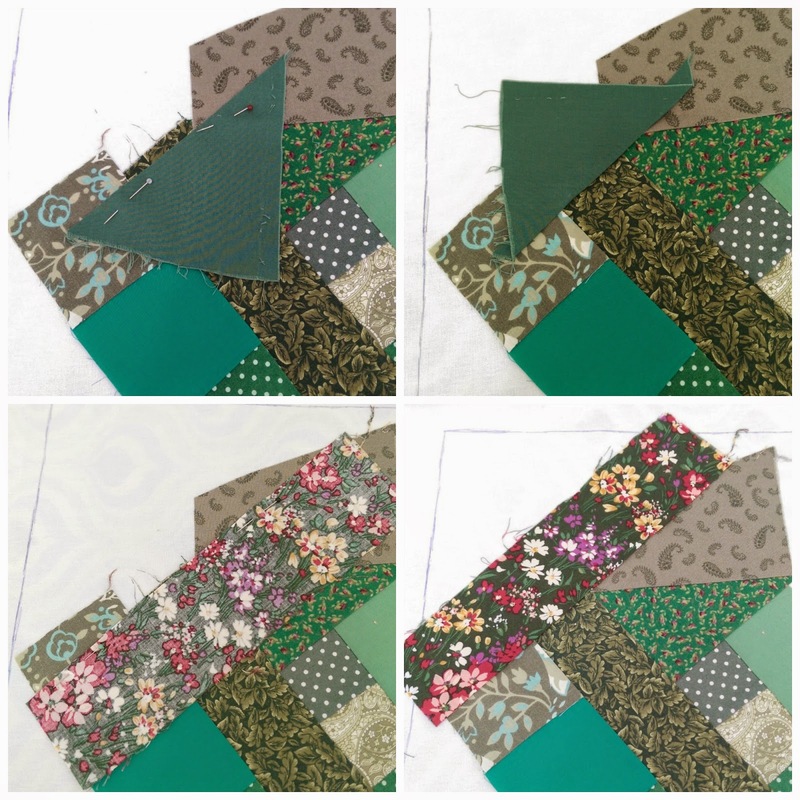 Christine has kindly allowed me to hijack her blog for the day to share my tutorial with you for turning your scraps into yardage. First of all you're going to need scraps, a fair few, all different sizes. I'm betting you've got a few handy, right? I like to press mine before I start, but they don't need to be trimmed, any old shape will do as you'll trim them after sewing. You might want to sort them into general size order to make choosing which scrap to use a bit easier. You'll also need some backing fabric. If you have some low loft batting and you're going to make a bag out of your scraps yardage, then that would be ideal. I used a stiff cotton canvas as I didn't have any non fusible batting. 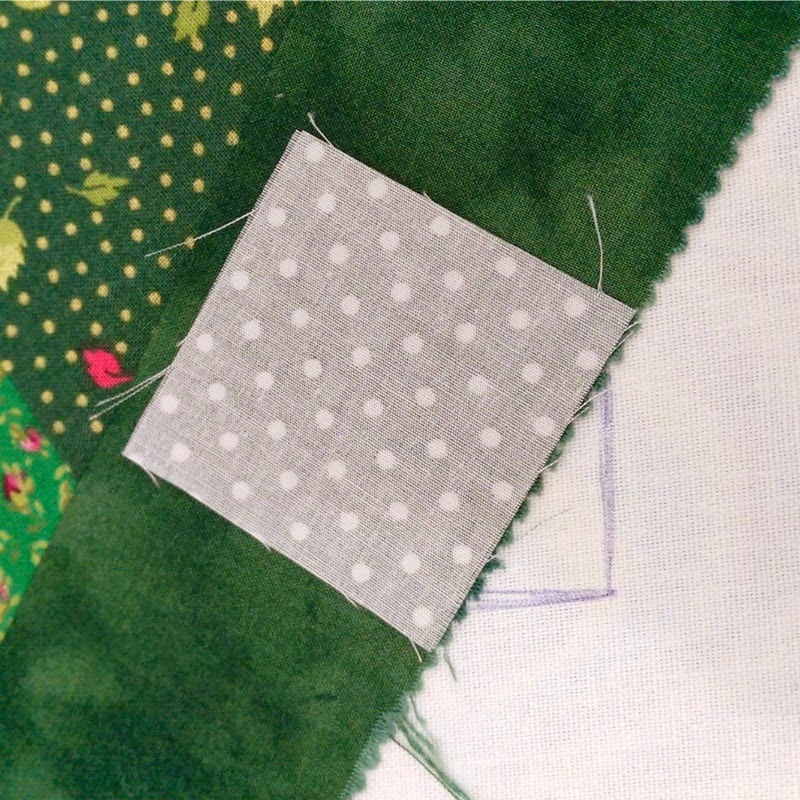 I then added fusible fleece to the back of the scraps yardage before making the bag up. Before we begin, all you need to remember is....there are no rules! Ok, there's one rule, I'll go into that later. The aim of this is to be as crazy as you like, oh and get some use out of that overflowing scraps bucket! 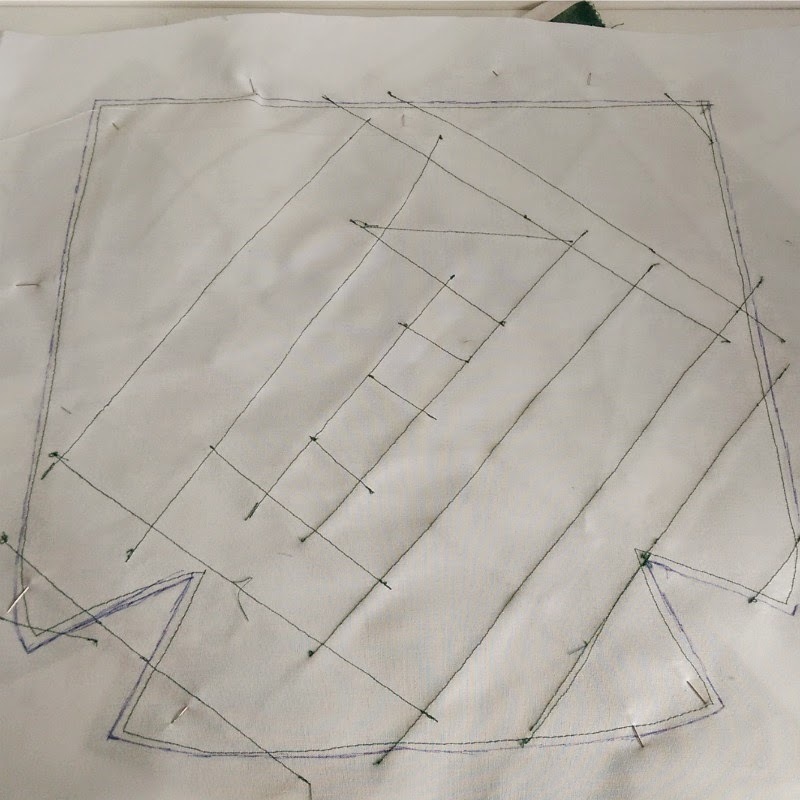 Firstly, trace your pattern piece onto your backing fabric, but don't cut it out. 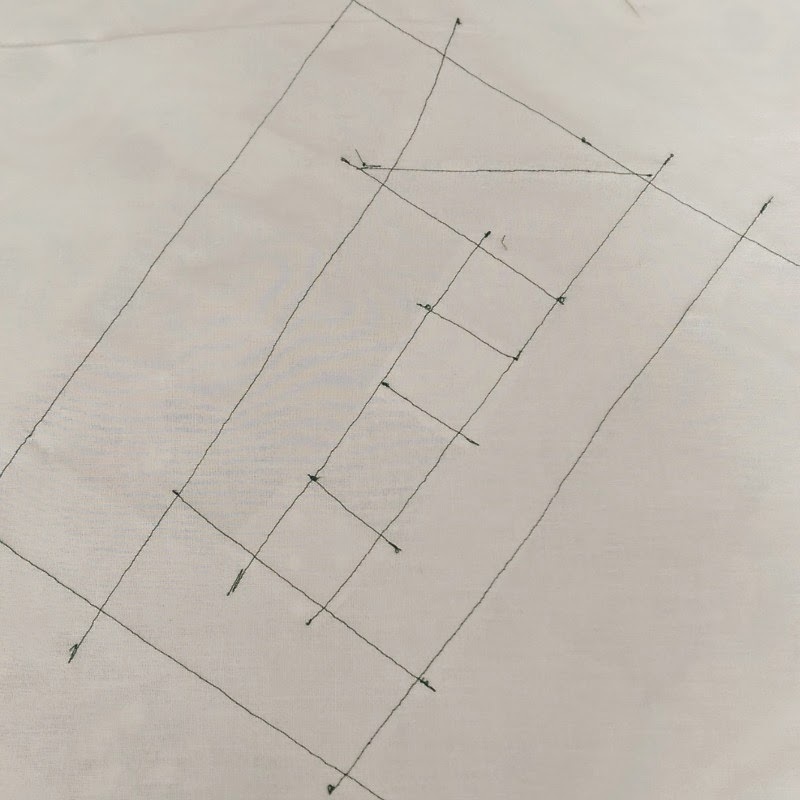 I like to trace it on both sides of my fabric, although you could just trace it onto the back and work on the front. 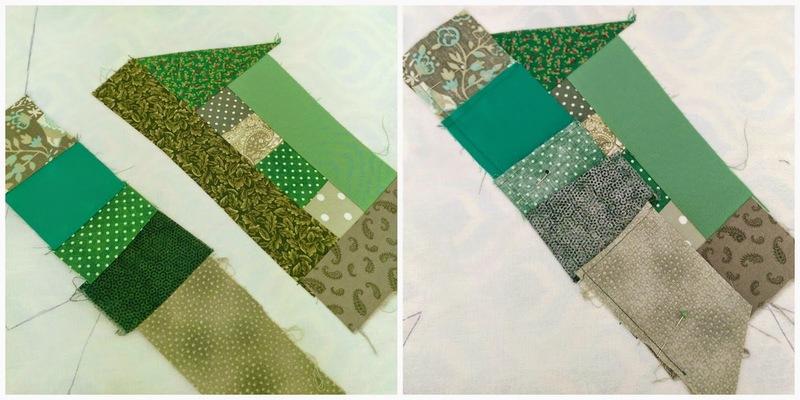 Next, start with your smaller scraps and choose your centre fabric. Lay another scrap on top, right sides facing. Stitch together using a scant 1/4" seam, then open out and press well. This is similar to paper piecing, but not. Keep adding scraps then pressing open. 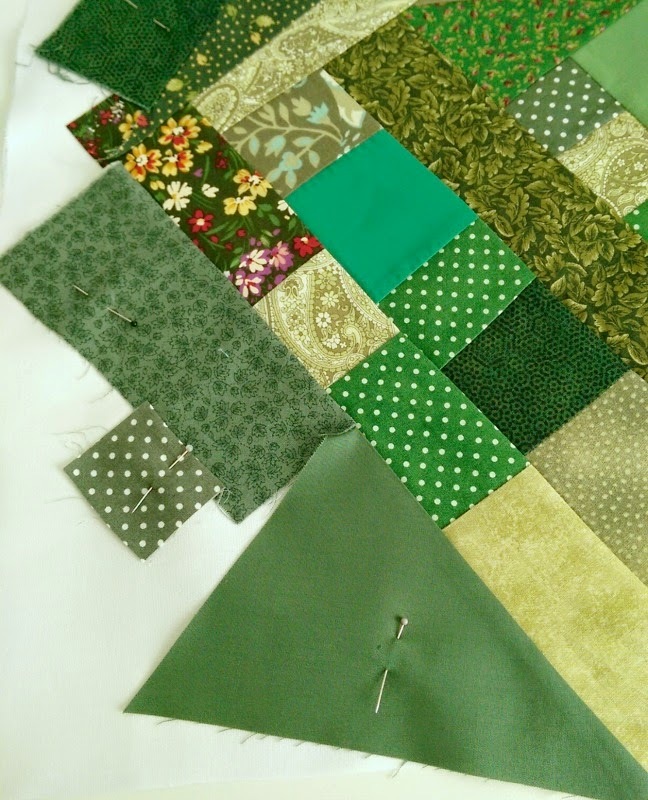 Work around the centre scrap, adding on all four sides, then working round again. If you have any bulk in the seams, trim those before pressing open. 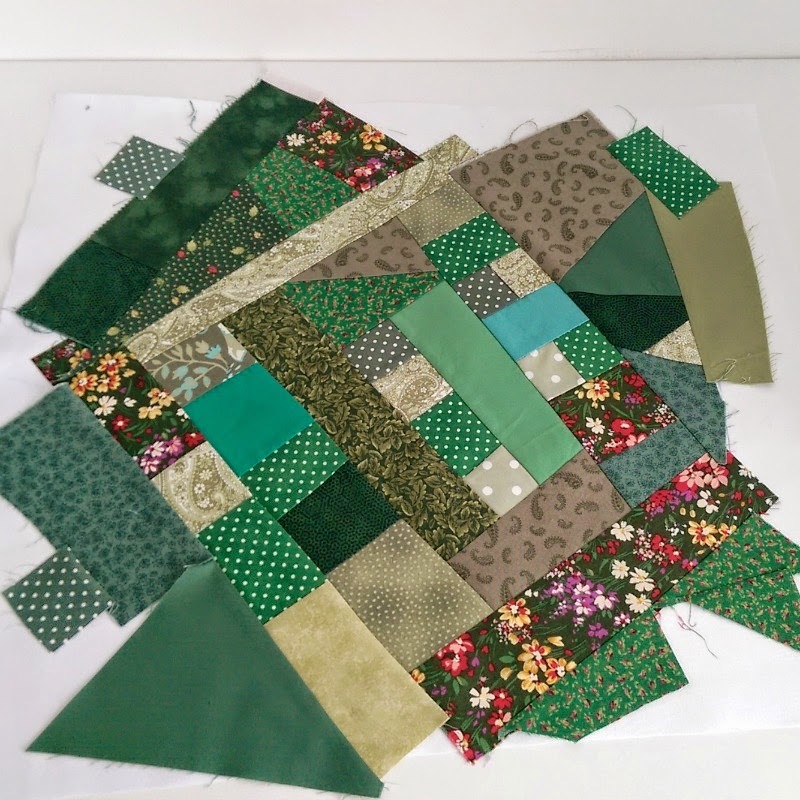 If you haven't got a scrap large enough to cover, then feel free to sew smaller scraps together to use as long longer piece. Now for the one rule. 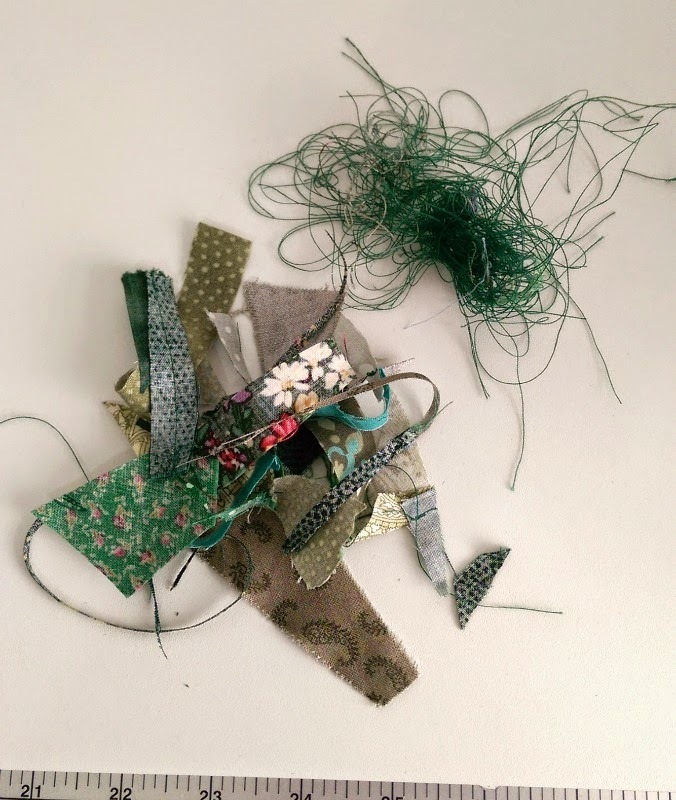 All new scraps must be larger than the one you're sewing onto. Or longer at least. 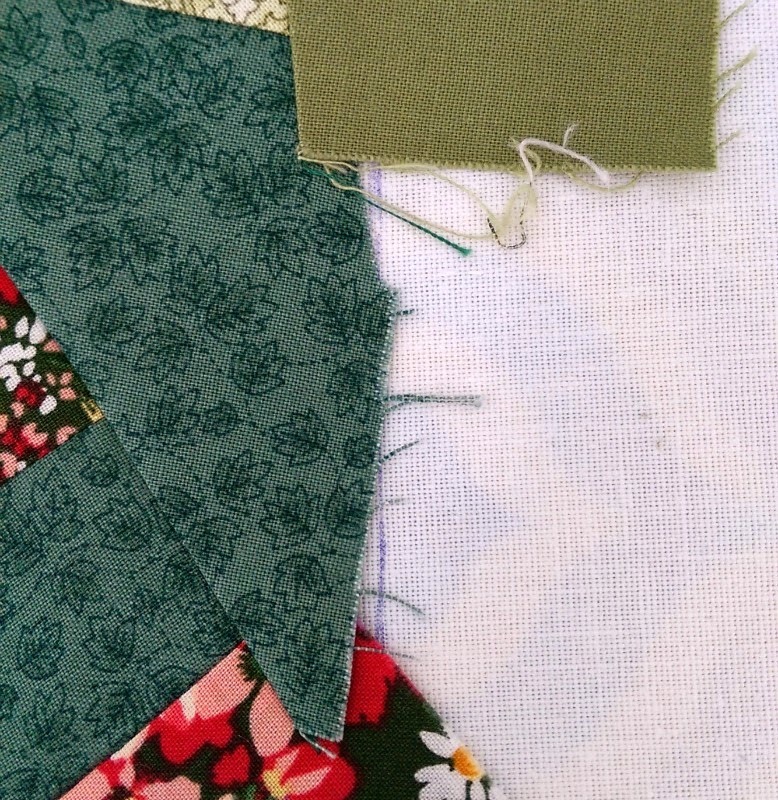 The green triangle below wouldn't be suitable as when pressed back it won't cover the other scraps and you'll have a raw edge open. You can solve that by appliqué-ing another piece on top of the raw edge, but it's a right pain. The flowered rectangle is a much better fit, although there will be some wastage on the scraps poking out. What matters is when it's pressed back. From the back you should be able to see that each seam is crossed over by another. You shouldn't need to backstitch, but I do just to be certain. I'm not gentle on my bags! Keep adding scraps until the whole of your drawn template is covered. 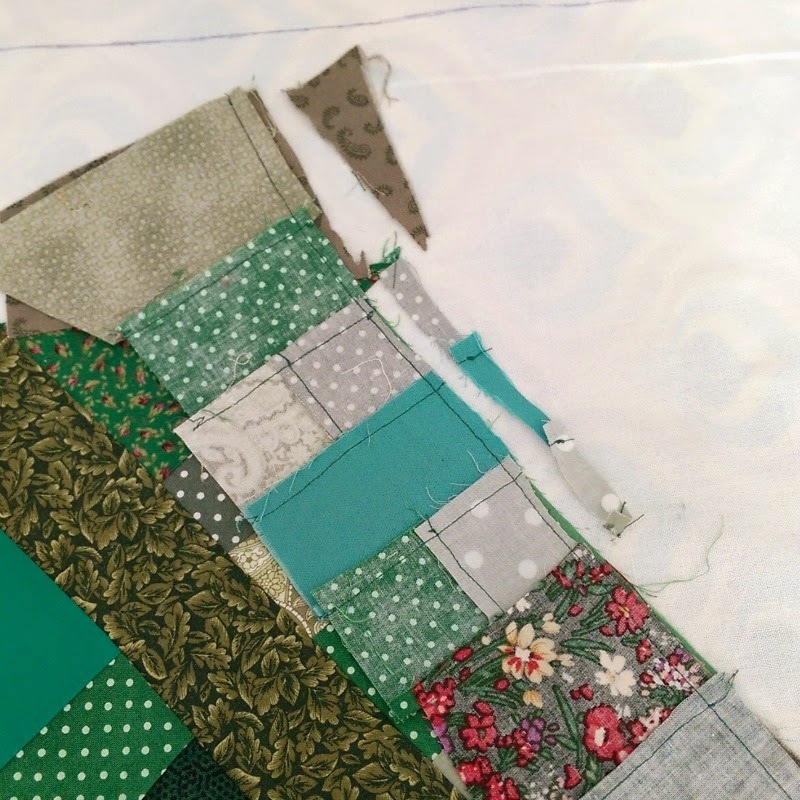 Don't worry if there are small gaps between your scraps and the template. As long as they're well within the seam allowance of the finished bag you can ignore them. Next, pin around the edges of the template that you drew to keep the raw edges from flooping around. Turn the backing fabric over so that the wrong side is facing up, and sew around the drawn template with a 1/8" (3mm) seam allowance. This will help keep those raw edges secure. Cut around the template exactly and you should have something similar to the below photo. You can then use this as per your pattern. I won't lie to you, it's not thrifty on thread. But the way I figure is that thread is cheap, fabric is definitely not! 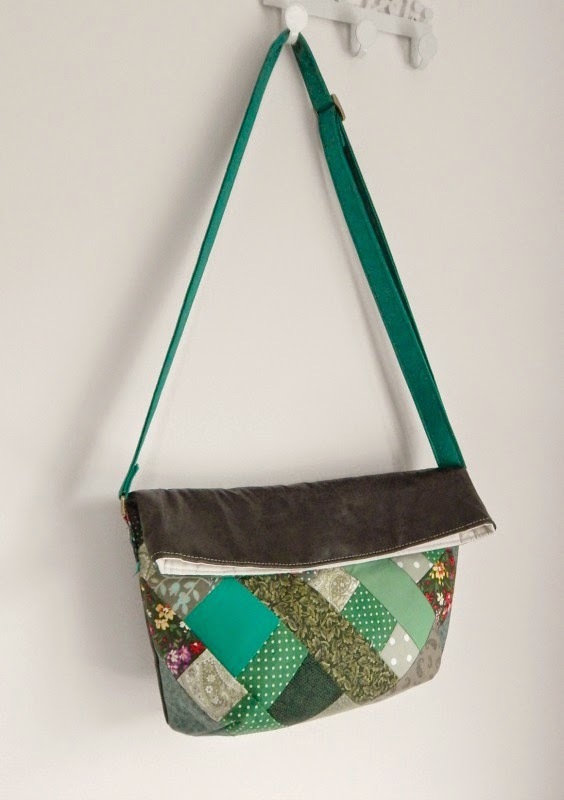 I used this piece as one bag main for my Slouchy Sling bag and paired it with some upholstery fabric. 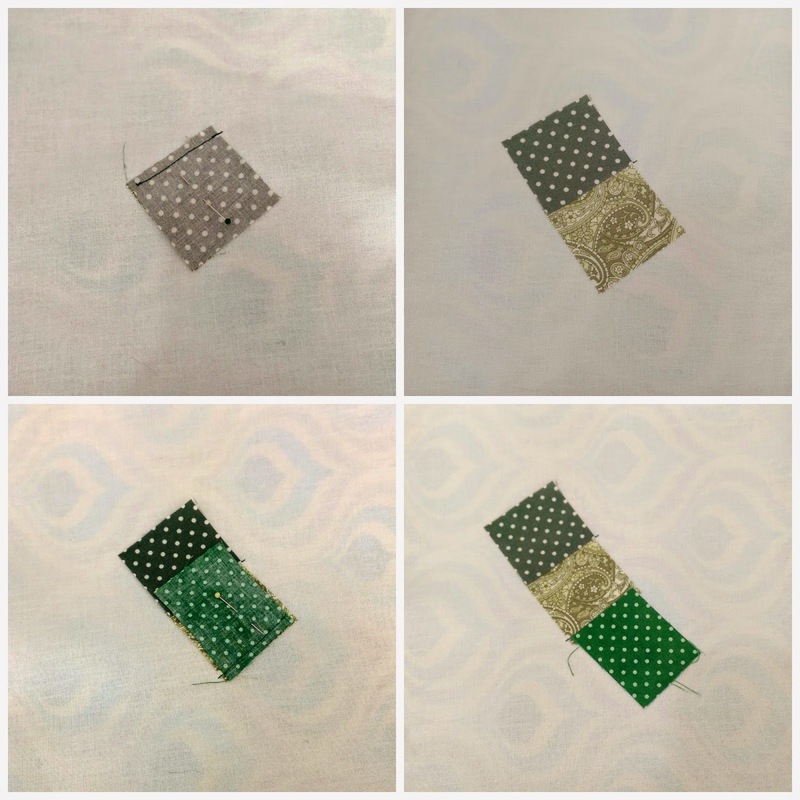 If you don't want to make a bag, why not make a rectangle and turn it into a table mat, or cushion cover, cut out an apron shape, oven glove or chair cover. Your house can be scrap-tacular in no time! 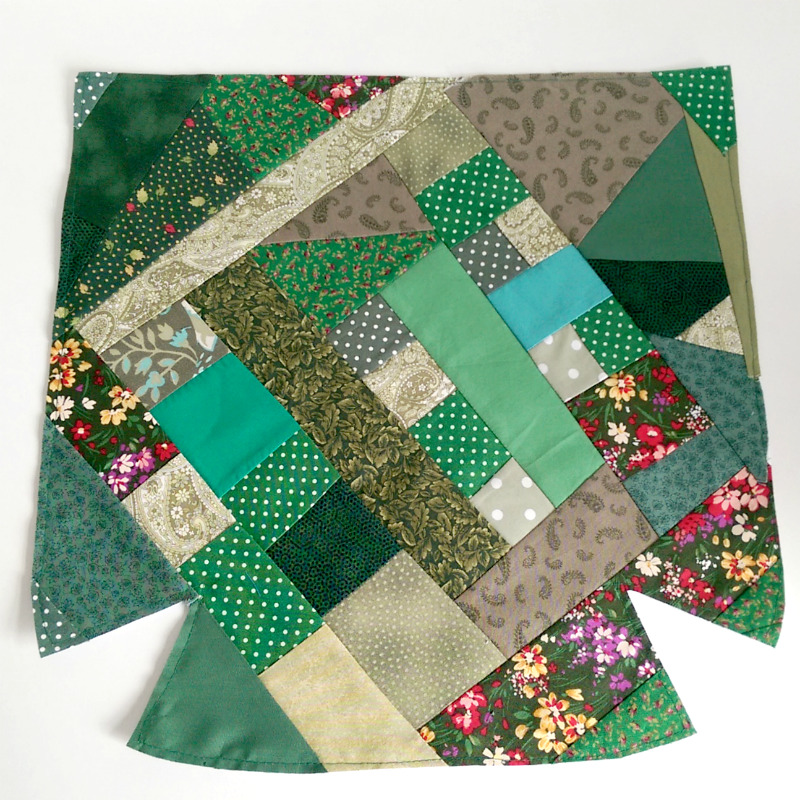 What will you make with your scraps yardage? 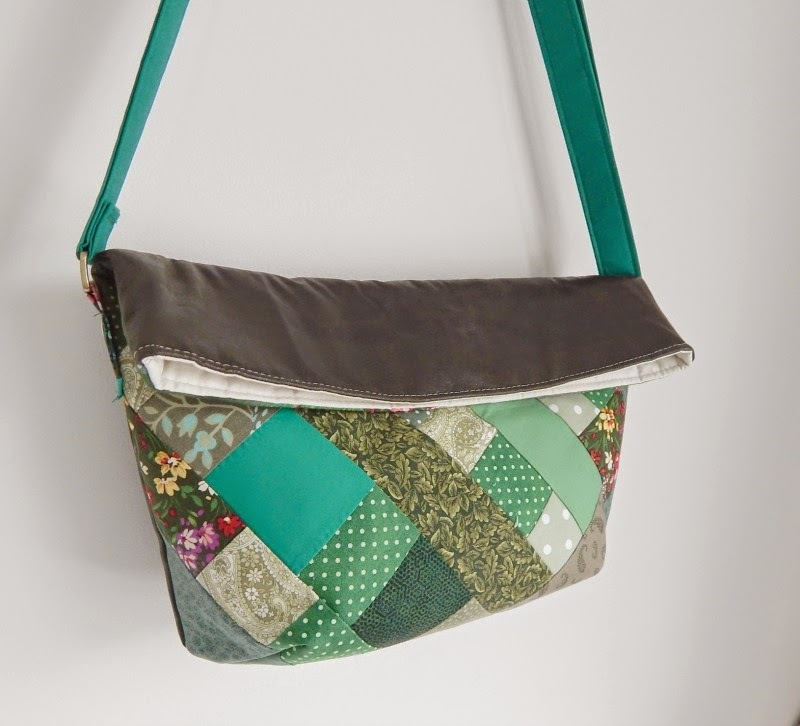 Samantha is an independent pattern designer, living in Wales, UK, who writes bag sewing patterns. You can find her over on her blog , or why not pop over to her Etsy store where you can get a whopping 25% discount on her Great Value bundles using the code BUNDLEBONANZA!